All fittings are in good condition. Dirk is made by Peter Henderson in Glasgow, Scotland during the Victorian era. The dirk is in overall good condition. The fittings on this antique dirk are made of a white metal with a thistle design and matching stones. There is a chip on the stone of the small knife. The grip is made of a synthetic material. 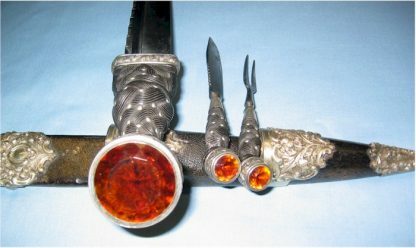 The dirk blade and small blade show some age. This antique dirk was made by Peter Henderson. 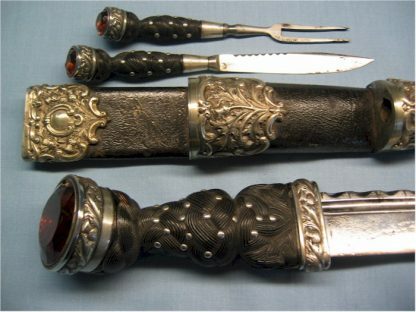 The fittings are made of a white metal with a thistle design and matching stones.